OK, so this one may be cheating… but seaplanes do technically have doors. And really, I’ll take any excuse to plug one of the greatest things this city has to offer. If you’ve spent a lot of time looking up in Sydney, you’ve probably seen these red planes flying around. Sydney Seaplanes first took flight in 2005 and now transports over 27,000 passengers every year. This winter, we definitely recommend treating yourself to aerial sights of some of the world’s most iconic views – the Opera House, the Harbour Bridge, Pittwater and Palm Beach, just to name a few. Finish your day with a Sunday roast in the newly built Empire Lounge. And if you’re feeling romantic, the company also offers three bespoke proposal packages, including roses, champagne and a personal photographer (unfortunately you have to provide the ring). There’s not much that gets me out of the house on a cold winter day like the promise of food. And at the Sydney Fish Market, you can eat while learning a thing or two along the way. For almost 30 years the Sydney Seafood School has been teaching keen home cooks how to prepare seafood, with a great line-up of classes in tow for the colder months. Prepare to learn under the culinary tutelage of Danielle Alvarez from Fred’s, Ross Lusted from The Bridge Room and Meena Throngkumpola from Long Chim. Alessandro Pavoni (Ormeggio at the Spit), Giovanni Pilu (Pilu at Freshwater) and Lucio Galletto (Lucio’s) fly the Italian flag, Michael Rantissi (Kepos Street Kitchen) and Somer Sivrioglu (Efendy & Anason) share the warm flavours of the Middle East, and Mark Jensen (Red Lantern), Christine Manfield and Nelly Robinson (nel.) bring their distinctive styles and signature recipes to the school’s winter line up. To keep things social, the school kicks off their Saturday night classes with a glass of wine and seafood canapes, offering a ‘book for six pay for four’ group discount for all classes as guests cook and eat in groups of six. They’re also keen to inspire the next generation of MasterChefs, offering school holiday classes for 8-12 year olds, featuring sushi in July and fresh pasta in October. We all know there’s nothing better than a Sunday roast, but as a catch 22, is there anything worse than slaving away on your day off cooking? Probably not. Enter, the best idea since sliced bread: the pub Sunday roast. During the colder months, many-a-Sydney establishment embraces the roast lunch and dinner. And we’re not just talking a slab of meat here, we’re talking mint jelly, vegies, Yorkshire puddings – the works. We’ve collated our top three, all of which would make your mum proud. Every Sunday available from 11.30am until late, with a meat offering that rotates weekly. Every Sunday you can find the ‘Roast at the Riv’, served for lunch from 12–3pm and then for dinner from 6pm – until sold out. The famous spectacle includes pork belly or a saddle of lamb served with Yorkshire pudding and all the trimmings. The Taphouse serves up roast beef and pork belly every Sunday for lunch from 12pm until sold out (usually around 6pm). You can also host your own roast for groups of 10 or more. Imagine starting your day in one of the world’s most iconic houses. Not only that, but finding your zen as you ignite your chakras looking over some of the most picturesque scenery in the world? 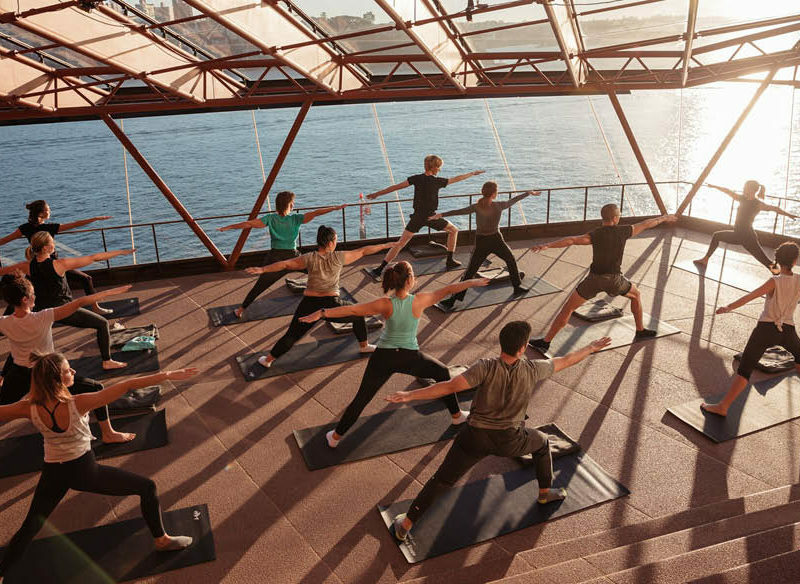 Well, until the end of August 2018, you can do just that, as the Sydney Opera House hosts ‘Sunrise at the House’, a series of indoor yoga classes held inside the warm Concert Hall Northern Foyer. 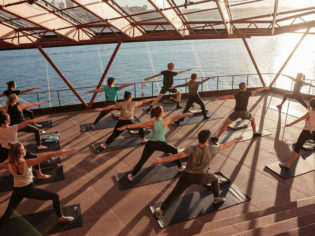 A qualified yoga instructor will guide you through a nourishing one-hour practice, and you get to gaze out over the beautiful harbour as you feel your body lengthen and open. Classes available at 7am on Wednesdays and Fridays and 8am on Saturdays until 31 August 2018. Speaking of working up a sweat, meet the fitness/dance craze taking over a dark room near you. The global community of No Lights No Lycra provides an inclusive and non-judgemental place for people to explore their moves. There is no light, no lycra, no teacher, no steps to learn, no technique, just free movement. It’s basically a dimly lit room full of people having a boogie to whatever soundtrack tickles the fancy of the ambassadors that week. They also have themes music events, where they may play exclusively 80s tunes, Beyoncé, RnB… you get the drill. There are a few Sydney venues to get excited about, boasting studios in Newtown, Darlinghurst, Bondi, Parramatta and Manly. There’s also no need to book a place, just show up when you’re in the mood for a boogie. It’s hard to think of an Australian exhibition more celebrated than the Archibald Prize. Located at the Art Gallery of New South Wales, the Archibald Prize is an annual portraiture exhibition eagerly anticipated by both artists and audiences alike. High profile and often controversial, the open competition began in 1921 from a bequest made by J.F. Archibald. The 2018 exhibition is a spectacle of impressive artwork, and the perfect indoor afternoon activity. Wander the gallery halls and see this year’s winner, Self-portrait, after George Lambert by Yvette Coppersmith, as well as portraits by Del Kathryn Barton, Guy Maestri and Jamie Preisz. To coincide with its exhibition of 2018 finalists, Art Gallery NSW has also organised a series of free public programs, including ‘Art After Hours: The Archibald Prize artists in conversation’, ‘Late Night Laughs’ art critique from top comedians, plus lots of great family programs. If you’ve frequented Instagram lately, no doubt you’ve encountered the neon goodness that is Holey Moley. This mini-golf club describes itself as a cocktail bar, mini-golf course, work of art and all-out cool hub rolled into one brilliant venue. With locations in both Darlinghurst and Newtown, this wet-weather haven turns the traditional putt-putt format into a feast of the senses, featuring unique holes that will have you feeling like Happy Gilmore in no time. For a dose of liquid courage, it also offers drinks and cocktails at the bar, taking care of all your off-the-green needs. Lock away your phone while you dine for a free cocktail and Contact Bar and Kitchen, Woolloomooloo. In the hopes of bringing back good ol’ face-to-face communication, and quality time free from the intruding light of a smart phone, Contact Bar & Kitchen in Woolloomooloo has brought something new to the table in an inventive (albeit controversial) move. The deal is, if you visit the establishment and volunteer to leave your phone behind the bar – in one of its cute phone lockers – you’ll score a free drink from the menu, and the same applies for your whole group. It’s a pretty great way to get people connecting again on a deeper level. Degustation is $49/head for 4 x courses and with wine pairing $78/head.